I entered the USA on a three month visa waiver program from Australia. I am about to return to Australia and would like to come back again to the USA. How long do I have to wait until I can re-enter the USA for another 3 months? There is no official rule on this. It is entirely up to the discretion of the customs office dealing with you at the border as to whether you can or can't enter. This applies whether you have a visa, or if you wish to use the Visa Waiver Program (VWP) with an ESTA. As far as I know, the prime directive of the border officer is to assume you intend to permanently live in the USA (i.e. immigrate there). It is up to you to prove otherwise. The amount of actual "proof" required may be very little. It could be (and normally is) as simple as your verbal statement that you intend to do XYZ whilst in the US, and intend to leave on a particular date. But, if you were very recently (like, less than 90 days ago) in the US for the maximum 90 days, it increases the probability the border officer will expect you to have greater proof you aren't abusing the WVP to live in the US. (With the VWP/ESTA) They may or may not ask to see a ticket to prove you intend to leave. You are, however, required to have one. So if they ask, and you don't have one, expect trouble. I would never suggest entering the US with an ESTA (under the WVP), without an outbound ticket. If your departure date is not fixed, and you want to enter on a one-way ticket, buy a refundable outbound ticket, and cancel it after you enter. There are scenarios that may increase the chances of triggering suspicion at boarder control. For example, if the records show you have been spending more time in the USA than you have outside the USA, the officer may decide you are mis-using the VWP system to "live" in the USA. Another example, if you have previously stayed in the US for the maximum 90 days on the VWP, and then you return, let's say, within 12 months of your previous entry (although, it's totally at the discretion of the officer you deal with) this can alert them to questioning you more throughly. I know of numerous first-hand cases when that second scenario has played out. One was a friend from Sweden who stayed 89 days on the VWP. She returned 11 months later, to visit for another 80 to 90 days (which she told the officer), and she was taken aside for 3.5 hours of searching and questioning. She missed her connecting flight, and had to go to great lengths to convince them she had zero intention or desire to immigrate there. Less than a year later she tried to return, as was denied entry. She now needs a visa for the USA. In my experience, it's generally best to avoid staying the full 90 days if you plan to return any time soon (like in the next 3 to 12 months). I've seen numerous cases when that alone was the trigger for hassles on re-entry. I avoid staying more than 80 days, if I plan to soon return. But again, it's entirely up to the border official you happen to deal with. The border officer might also take into account how much you are in your home country, as opposed to elsewhere. Someone re-entering the US after having recently left the US, who hasn't been to their home country for a significant period, is more likely to come across as someone who has poor ties to their home country, and therefore is more likely to try an immigrate to the US. My personal experience is that some ports of entry have officers with significantly stricter attitudes. Others are more relaxed. For instance, in my experience, the difference between entering the USA via Florida and New York is like night and day. I've entered through both on many occasions. I've also noticed a significant difference between LAX and SFO when entering on the West coast. Although, I will say recent (2015 to 2017) experience at LAX has been more relaxed. I always come and go through SFO if possible. It's not as much of a difference as MIA and FLL (both in Florida), but enough to warrant avoiding LAX and NYC if possible. Also the airport is less busy in SFO so that's a plus. It is my understanding that if you are denied entry you will require a visa to return to the USA (and this will hold true for a period of 10 years). Receiving a visa may also be more difficult if you were refused entry at the border. You will likely have to go to much greater lengths (if even possible) to prove the validity of your reasons for visiting the USA, and applying for a visa. Caution is advised. Simply put, the more you come across as someone who has no interest in immigrating the US, the better. Which means, someone with definite ties to their home country (job, business, family, house, etc), and with a clear plan of travel in the US, and a clear departure date (within the 90 day allowance), the greater your chances the border official will stamp you in without any hassle. Dress well, give clear answers, smile, cross all your Ts and dot all your Is, and chances are it'll be fine. Ultimately, it all comes down to the discretion of the border official. The Visa Waiver Program doesn't work that way. If he decides to use the Visa Waiver Program (ESTA); maximum stay is 90 days and he needs to allow adequate time between visits. The rule of thumb is if he is in the US for 90 days; should be out of the U.S. for 91 days before returning. I think you can enter again the day after you left. I remember entering again about 100 days after I entered the first time (so not long after the end of the 90 days, but a while after I left the country) and I have friends who entered a lot of times and on a regular basis so they probably had maybe 2 weeks between the time they left US (and gave their I-94 back) and they entered again (filling a new I-94). We were all European and part of the Visa waiver program. Be careful, though, to do the ESTA procedure if you arrive by plane (likely in your case). Not the answer you're looking for? Browse other questions tagged usa customs-and-immigration legal us-visa-waiver-program repeat-visits or ask your own question. How long is the time allowed between exit and re entry from the U.S on an esta visa? 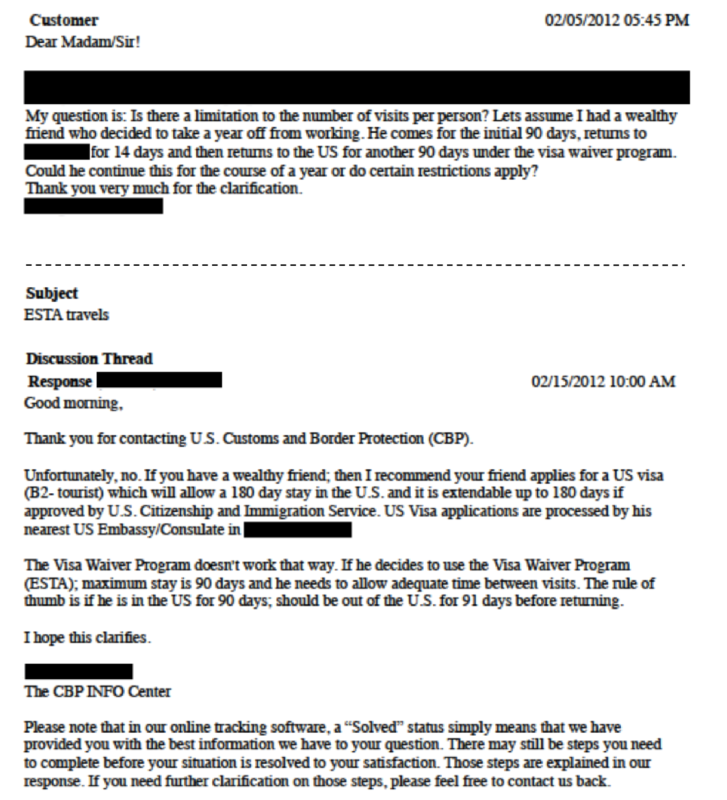 Leaving the USA after the visa waiver expired? Road tripping the US from UK with 90 day visa waiver more than once a year? Do I need a second US visa waiver to re-enter after a short trip from the US to Canada?